Kaffeine version 2.0, launched in Jun, 2016, has its GUI written on the top of KDE Frameworks 5 and Qt5. For video/audio playback, it uses libVLC as backend, and it interfaces with Linux TV devices via libdvbv5. It has a simple but intuitive interface (example live TV screenshot) and is easy to setup. Amongst its list of supported formats are CDDA, VCD, DVD, .... and, since versions >0.5, it also provides full DVB support. The latest version is 2.0.3. EPG, EPG-driven recording timers, OSD EPG now and next. 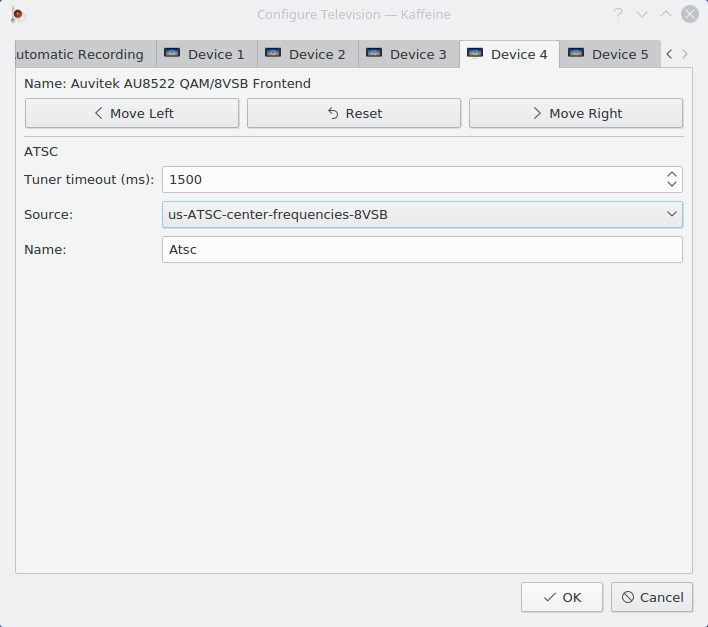 Kaffeine can simultaneously play and record different channels within the same transponder. Nicely handles mutiple frontends on a single device (for example a multi-standard card supporting DVB-C and DVB-T/T2 on the same frontend). Channel scanning on multiple devices/frontends, and multiple satellites. DiSEqC 1.x switches, DiSEqC 1.2 rotors and USALS. PS. : if it is the first time you're using, the channel tab will be empty and the main screen will be black. D) Click on the appropriate "Device" tab ... if you only have one DVB device installed, it should be "Device 1"
H) Once the scan is complete, highlight all channels found in the right-hand box "Scan Results" (or all that you would like to save) then click "Add Selected" and those channels will then appear in the left-hand box called "Channels"
I) Hit "Ok" to get out of "Channels" window and you will return to Kaffeine "Digital TV" window with your selected channels appearing in the left margin column. j) Double click on a channel to select -- and now hopefully you are watching ! PS. : The above was tested with Debian SID and Ubuntu Xenial (16.04). Other versions may have different requirements. On Fedora, you need a repository that provides VLC. For stable fedora releases, you could use the rpmfusion repository. See http://rpmfusion.org/Configuration/ for instructions about how to set it up. For Fedora rawhide and beta releases, you could use, instead the Unitedrpms repository: https://unitedrpms.github.io/. Please read at https://github.com/UnitedRPMs/unitedrpms.github.io/blob/master/README.md for instructions about how to set up. PS. : The above was tested with Fedora 23 and Fedora 24. Other versions may have different requirements. If you run openSUSE Tumbleweed, you can find an up-to-date package with the latest state of git in the KDE:Unstable:Extra repository. If you are using openSUSE Leap or openSUSE 13.2, you will need to compile from sources instead. You need to be using at least OpenSUSE version 13.2, in order to have KF5 and Qt 5.5 at their repositories. If you're running OpenSUSE version 13.2, you'll need to compile the libdvbv5 by hand, as it is not provided there. OpenSUSE Leap (version 42.1) seem to have it already packaged as libdvbv5-devel. PS. : The above was tested with openSUSE 13.2. Other versions may have different requirements. This step is optional, and should be done only if you want to use Kaffeine on non-English setups. For further information look for generic KF5 / cmake instructions. Accessing Kaffeine remotely via X11/ssh/vnc can be a problem, as Qt5 will, by default, use hardware acceleration and DRI3. Another solution is to use a vnc server. 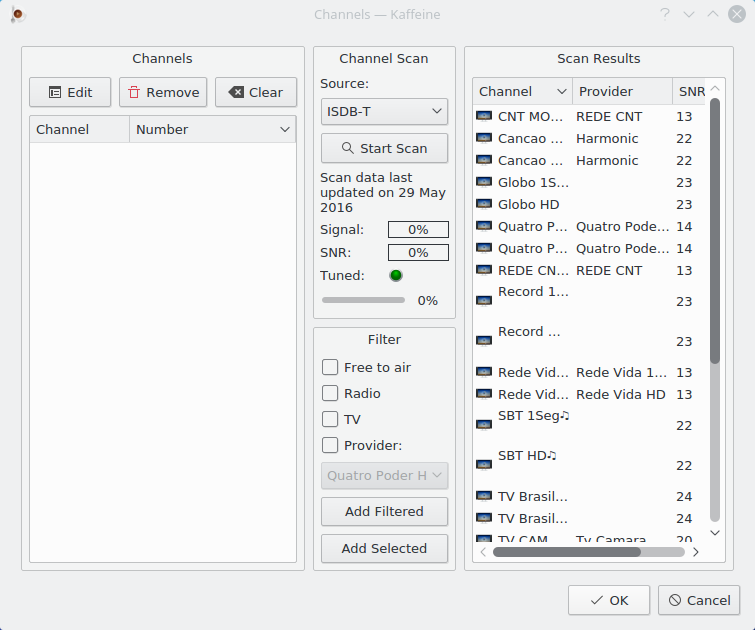 Kaffeine uses the file scanfile.dvb with a list of known channels per locality and per Satellite (for DVB-S/S2). The scanfile.dvb file is weekly updated when new patches are added to the Digital TV scan tables git tree. 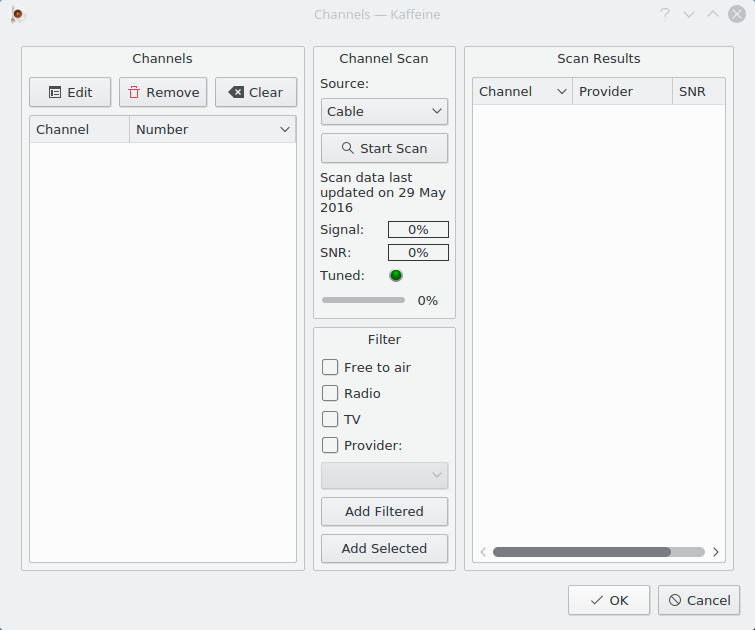 The new patch will be added to scanfile.dvb and the updated file will be available to be updated from the Internet in the Kaffeine application. https://blogs.s-osg.org/watching-digital-tv-via-kaffeine/ Watching Digital TV Via Kaffeine] explains how to compile Kaffeine version 2.0. Originally, Kaffeine was written using KDE 3 and were maintained at SourceForge. Old versions of Kaffeine 0.x and 1.x are still available there. The oldest available version there is Kaffeine 0.3.2, writen in 2003 by Jürgen Kofler. Later, Christophe Thommeret joined the efforts. The latest Kaffeine release 0.x is a KDE3 application although it can be made to run under KDE4. Kaffeine versions 1.x are rewritten to use KDE4. On that time (April, 26 2009, with Kaffeine version 1.0-pre1), Kaffeine was migrated to kde.org, and it started being maintained by Christoph Pfister. On versions 1.3.x, the maintainership switched to Lasse Lindqvist. The authors claimed that features in Phonon were required, although this was disputed by Aaron Seigo. See http://dot.kde.org/1166377123/1166385374/1166438293/ and http://hftom.free.fr/phpBB2/viewtopic.php?t=18. Some work had been done on a better on-screen display (OSD) using OpenGL. It was under development here http://websvn.kde.org/trunk/extragear/multimedia/kaffeinegl/. Such work sounded like some development testing to improve the interface rather than a full Kaffeine program. 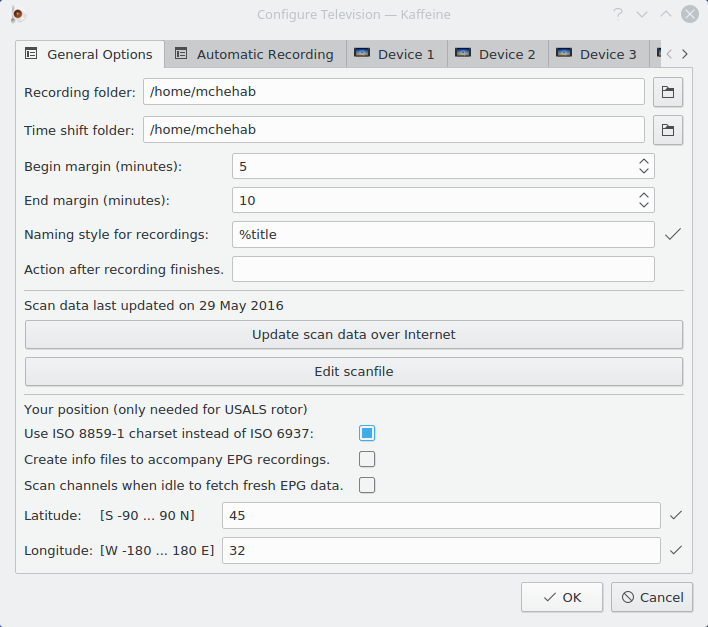 In Jun, 2016, Mauro Carvalho Chehab annonced Kaffeine port to KF5 and started maintaining Kaffeine version 2.0, based on KF5/Qt5, libVLC and libdvbv5. This page was last modified on 15 January 2017, at 06:11. This page has been accessed 160,989 times.